FireFusion is gearing up for the holidays and Dante and her team and working on building the perfect gifts for your loved ones. One of the most popular gift options is the encasing on photos onto steel or copper. Along with all of BSU medallions imaginable, Dante is busy crafting ornaments and jewelry for a memorable holiday season. Delia Dante is the embodiment of passion—a captivating spirit that puts her heart and soul into everything she sets her mind to. Dante’s burning dedication for art and the craft of enameling is matched only by the fire that she uses to create her masterpieces. A natural born artist, Dante began her career as a junior-high school art teacher. She spent twelve years inspiring students to create from the heart and loved every minute of it. Dante has always sought personal evolution and firmly believes that we must keep learning in order to progress in life and within ourselves. It was this belief that triggered a rapid change in vocation and the decision to return to school. In 2004, Delia set out to finish her dissertation. This journey led her to the meeting of one of her mentors, John Killmaster, internationally renowned enamel artist. 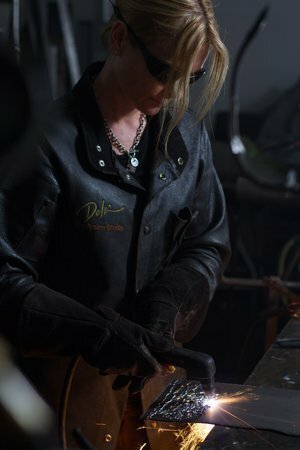 At this point in her life, Dante was an experienced sculptor, but had never witnessed the fire infused luster that is the art of enameling. She laid her eyes upon the glowing magic orb of glass and metal and fell immediately in love—this would be the topic of her dissertation and the first step toward the rest of her life. As she worked tirelessly on her hundred page dissertation, documenting both the history and processes of enameling, she was introduced to a new side of the art world that continually sparked wonder and fueled her imagination in ways she had never explored before. In April of 2004, Delia held her first enamel art show at the Piazza di Vino and nearly sold out. Expressions in Enamel was a huge success and helped propel Dante further into her future of becoming a renowned enamel artist herself. 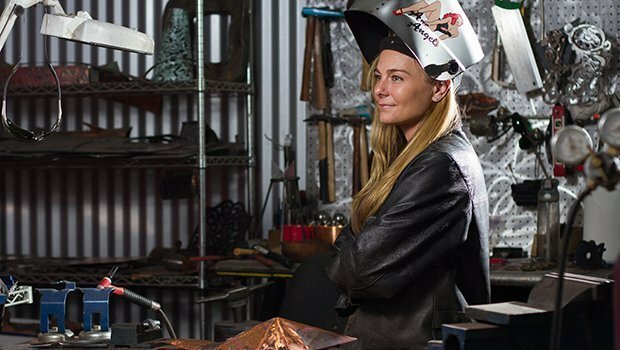 About three months into teaching herself how to weld copper, Delia was presented with the opportunity of a lifetime. Robert Castoro, owner of Barbacoa in Boise, was in search of a unique, metalwork sculpture and commissioned her to create the piece. The goal: a larger-than-life rendition of Medusa, to be completed shortly before the restaurant was to be opened, giving her a little over two months. She worked fervently day and night in her garage to complete the piece. With no time to spare, “Me Deuce” was crafted, standing at an impressive fourteen feet, complete with ten foot long, intertwining tentacles. Castoro was floored and proudly displays “Me Deuce” in his restaurant to this day. Her art can now be found in homes and businesses across the Treasure Valley, each with its own unique allure. Dante’s latest endeavor is her FireFusion studio located off of Front Street. Partnered with Boise Art Glass owner Filip Vogelpohl, the two renovated the historic Bogie’s building and designed an art studio that encompasses both of their passions into one immaculate studio. The studio serves as a gallery, a retail store, and a classroom. 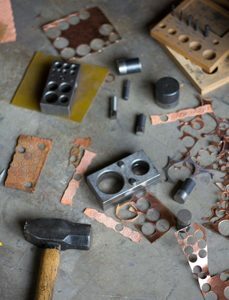 Dante offers one-on-one enameling classes as well as specials for larger groups. This is her first experience in retail and she is once again learning the ropes of a new skill as fast as she can. Dedication and determination are key to Dante’s imagination and inspiration coming to life. The message of her story exudes a deep and prominent meaning—never give up, and don’t let fear govern your life. Too many times artists take a step back from their passion for fear of failure. Art is at the root of mankind and will no doubt be a monumental part of us forever. Take risks, be bold, and never stop learning.